Members of the Muslim community attach great importance to their personal law, especially in matters relating to marriage (Nikah) and divorce (Talaq). Despite the fact that, under Mauritian law, Nikah without civil effect is recognised as a valid marriage, the legal implications of this type of marriage are not very clear. The Supreme Court of Mauritius has on several occasions refused to interfere in matters relating to Nikah and Talaq due to a lack of jurisdiction. Unaware of this legal vacuum, parties to a Nikah, most particularly the wife, are often left without effective legal remedies, leaving the door open to exploitation and social degradation. To fill this legal vacuum, our centre offers advice and legal solutions on this matter to ensure that parties to a Nikah (without civil effect) are legally protected especially in cases of separation or divorce. Our centre also processes Judicial Talaq and Khula in cases where a husband is refusing to free his wife from the bond of marriage without proper justification. Contrary to popular belief, under Islamic law, a Nikah is not a sacrement but rather a purely civil contract. This is why Nikah is referred to as "Aqd un Nikah" - The contract of Nikah. 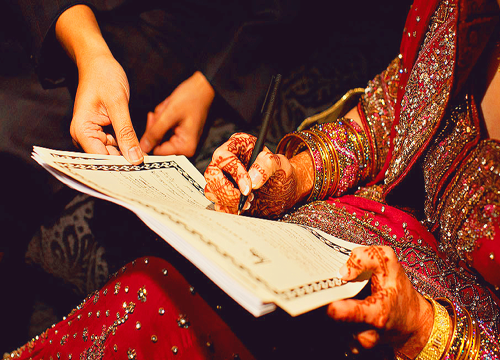 The contract of Nikah has its pillars, conditions and subject matters. According to prevailing opinions, a contract of Nikah may be varied. This means that parties to the contract may stipulate conditions in the Nikah contract as long as those conditions are not contrary to the spirit of marriage. Many Muslim countries around the world have allowed stipulations to be inserted in a marriage contract. By inserting conditions in a marriage contract, a party may easily opt out of a marriage if any of those conditions are not respected. This will also facilitate mediation and eventually divorce if the same is inevitable. By inserting conditions in a Nikah contract, parties to the contract will know with sufficient clarity what their rights and duties are. As an example, a wife may stipulate in the Nikah contract a condition that her husband will not have a second marriage while he is still married to her. In case the wife is a foreigner, she may insert a condition in a Nikah contract to the effect that her husband will send her to visit her family after an agreed time period, depending on his means. Our centre can offer its services to assist you in drafting a suitable Nikah contract which will suit your needs and aspirations and also help you protect your rights. We can also arrange to conduct your Nikah ceremony. At the ceremony, couples will be explained thoroughly of the implications of a Nikah contract as well as their rights and duties. Such an approach is important in order for the future husband and wife to understand the importance of the act they are committing themselves to, the legal implications of the contract of Nikah, and the solemnity of the ceremony. The couple, the witnesses as well as the guardian of the bride will be made to sign a properly drafted contract prepared by the FAMILY MEDIATION CENTRE. Arbitration is one of the methods prescribed in the Quran to overcome marital dispute. Arbitration meets its full potential when it is carried out by knowledgeable and trained arbitrators. Disorganised arbitration tends to accentuate marital dispute and opens ways to further disputes. Our arbitration service is a professional one. It ensures that parties understand the consequences of their marital dispute from both an Islamic and legal angle. Our impartiality ensures that justice is done to both parties. We follow the proper methods of convocation and ensure that parties are aware in advance of what is expected from them. We encourage parties to be accompanied by at least one member of their family who will ensure that the recommendation resulting from the arbitration is followed. A detailed, written recommendation is given to the parties following the arbitration. Our services are highly confidential and the privacy of your matrimonial matters is guaranteed. Under Islamic law, divorce can be either judicial or extra-judicial. An extra-judicial divorce is one that does not require the intervention of a Court of Law or any other specific body. All schools of thoughts are in agreement that a husband's right to divorce his wife is unilateral. He does not require a court intervention to do so. However, given the fact that divorce is a civil matter, many Muslim countries have introduced reform in the way a husband can divorce his wife. Tunisia for example, has abolished the husband's right to divorce his wife unilaterally. Every divorce in Tunisia has to be judicial. Iran has made it a requirement that before a husband can divorce his wife,a certificate of "irreconcibility" is required. As for countries like Pakistan and Bangladesh, as soon as a husband divorces his wife, he will have to give notice to a specific body, failing which he will commit a criminal offence. All these reforms have the common aim of preventing abusive divorce on the part of the husband. Given the fact that Islamic divorce is not regulated in Mauritius, parties to a contract of marriage may stipulate in a Nikah contract what mode of divorce they would prefer if ever the marriage has to be dissolved. This will allow the wife to protect herself from abusive divorce and avoid unpleasant surprises. Khula is the right of a wife to free herself from the marital bond. Many Muslim women are unaware of this procedure and find themselves trapped in situations where their husbands are abusively refusing to grant them divorce. Our centre will provide the necessary services to ensure that any Muslim woman deserving of Khula obtains the same after all the Shariah procedures have been followed. It is to be noted that under the Shariah, a Muslim woman can ask for Khula in cases where she is suffering from either direct or indirect harm from her husband. Many Muslim countries have adopted reforms along the line of the Maliki school of thought which is of the opinion that a Muslim woman can petition for Khula on the ground of "Dhara" (harm). Countries like Pakistan has provided for 10 statutory grounds on which a woman can ask for Khula. Our services are efficient and thorough. Papers will be duly served on the husband through a private Usher and the husband will be duly summoned to come and answer the allegations made by the wife in her application. After due consideration has been given to both parties, a written judgement will be issued explaining the decision to either grant or refuse Khula. We can also assist the parties to draft a post-Khula separation agreement. This applies mainly to couples who are civilly married and are intending to divorce each other by "mutual consent". This type of divorce has been made possible by recent amendments to the Divorce and Judicial Separation Act in 2011. Divorce by "mutual consent" reduces hostility and litigation costs between parties. To be able to obtain a divorce by "mutual consent" parties are required to sign a mutual agreement which regulates issues like custody of children, alimony, properties etc. The agreement is presented alongside the petition to the Judge who will have to formalise the same. Our centre can assist Muslim couples in drafting their divorce agreement in line with Islamic principles and also process their civil divorce. It is incumbent (Fard) on every Muslim who has wealth to make a will. It is forbidden for a Muslim to remain intestate (without a will) for more than three days. Making a will helps eliminate disputes among your family members after your demise. It also ensures that all your debts are recorded so that after your demise they are taken care of by your heirs and family. We can help prepare your will and help you fulfill your Islamic duty at a reasonable cost. Inheritance is known as one of the most complex subjects under Islamic law. The Civil Code of Mauritius states with sufficient clarity the rights of the heirs and successors. By using our expertise, we can help you in matters of inheritance in line with Islamic principles without having to derogate from Mauritian law. Under Islamic law, difference has to be made between inheritance (wirathat), wills (Wasiyat) and gift (Hiba). Each one has their distinct rules and conditions. The rules of inheritance only take effect when a person dies. The same applies to a will although the deceased person cannot give away more than 1/3 of his wealth through his will. As for Hiba, they are gifts given to your children or family during your lifetime. We can help you make the right choice to avoid future family disputes and ensure that certain categories of people receive their fair share of your wealth.